Spring and ideas "flowering"... 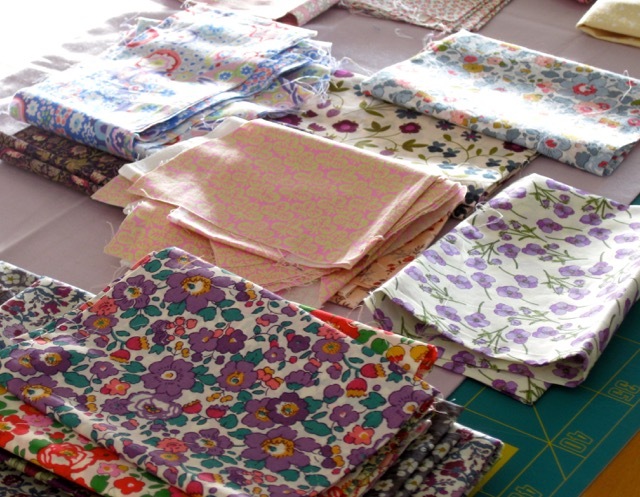 I don't know where to start... playing with my Liberty fabrics for a new lap quilt? Maybe... most probably! The best and funniest part of the project : choosing and matching the various prints. Well it's fun, but not so easy (at least or me). 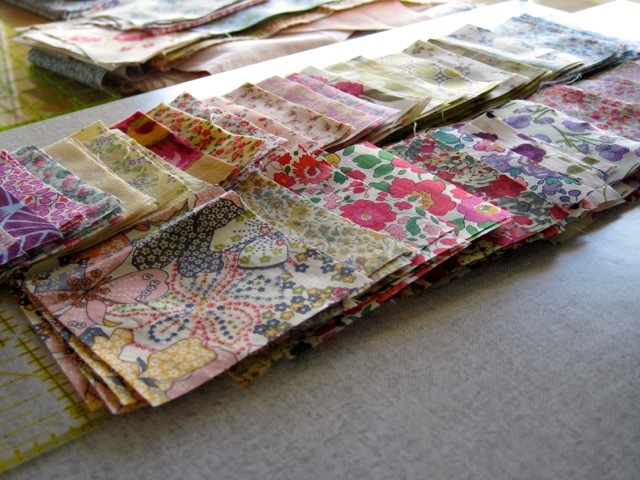 I thought I could try to mix the Liberty fabrics with some of my old leftovers, and make a scrappy Four Patch quilt. http://www.butterflythreadsquilting.com. It's one of my favorite blogs, I never miss her posts and always find them interesting. She has valuable tips and tutorials. Most of all, her quilts are fabulous. I highly recommend reading her blog! 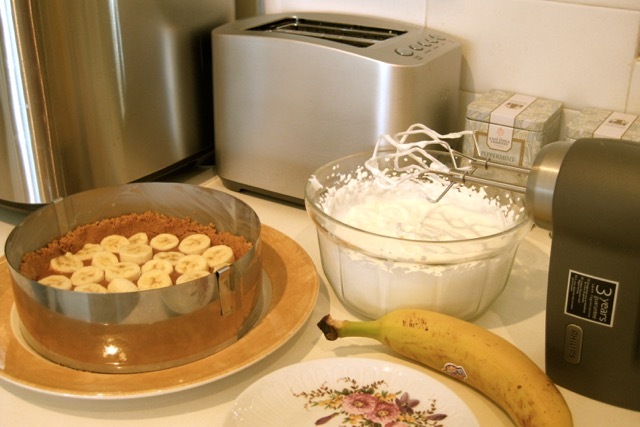 Last Monday, receiving my quilting friends, I prepared a Banoffee pie. I must say I am crazy about this pie recently. I discovered it last summer in Rhodes in a pastry shop held by an American woman. Since the I have in mind to make such a pie. I searched various recipes on the web and decided to give it a try. I wanted to take pictures of the finished cake and of the quilting creations of my friends, but my daughter arrived with her baby and I forgot everything! Anyway I have to say that the Banoffee pie was very well appreciated : not a crumb left! Sunny flower fabrics... :o)) can feel the spring in it too ! 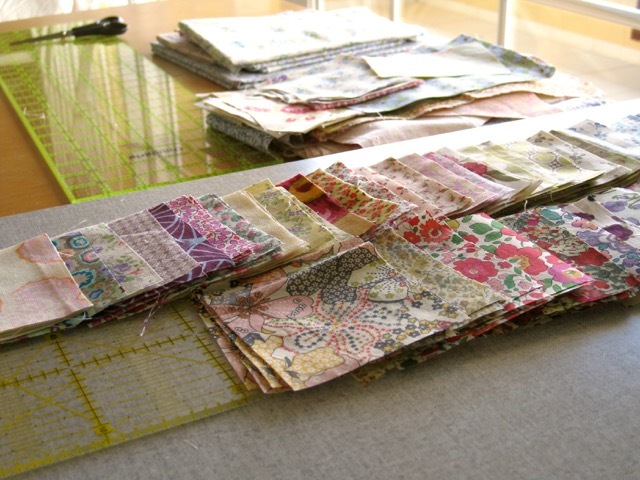 Looks like a pretty quilt in the making. So many nice flowering prints. The cake looks yummy too. Can't wait to ses what happens with those Liberty squares! 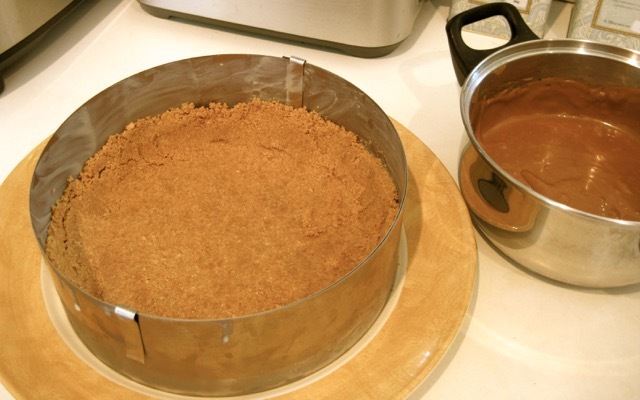 I'm intrigued bythe banoffee pie, could you share the recipe you used? Toujours plein de projets..plein de jolis projets, pleins de fleurs,pleins de couleurs....nous attendons avec impatience les premieres ebauches de cette nouvelle realisation...Quant au banoffee !! je vote oui !!!!!!! delicious !!! Merci Agnes, tu n'auras pas a patienter trop longtemps, le nouveau top est pratiquement termine! Not surprised nothing was left after your guests finished with the pie - looks delicious! Love the way you have Liberty prints mixed with KF fabrics. This is my first visit and the beautiful fabrics make my fingers tingle. I want to make something. And eat pie.